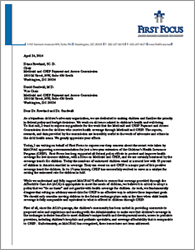 In response to their recommendations, First Focus sent this letter to the Commissioners. While we understand and fully support MACPAC’S efforts to ensure that coverage provided through the ACA is appropriate to meet the needs of children, we believe it is critical to adopt a policy that we “do no harm” and not gamble with health coverage for children. As such, we fundamentally disagree that setting an arbitrary sunset date for CHIP is an effective way to achieve these important goals. We should consider moving children to the exchange plans only when that child health coverage is fully comparable and equivalent to what is offered to children through CHIP. We want to be sure that children are not moved out of CHIP before all of the issues are addressed and we can be sure that children won’t be worse off.